We have spent over 15 hours with the Rapsodo Hitting Monitor. In that time, we have recorded at least 1,000 hits within indoor and outdoor cages, as well as on outdoor fields. Those hits ranged from low end players to high bat speed players and occurred from tee, soft toss, pitching machine and live pitching. We measured the accuracy of the device in terms of total distance. After all that, we can say with confidence, the Rapsodo Hitting monitor works as advertised. The app is relatively seamless, data analysis is easily interpreted, and the device feels secure. The use of Statcast in the MLB provides remarkable insight into the game. Data analysis of ball flight at our fingertips is a dream come true for player, fan and coach alike. But, it should be noted, even Statcast struggles with accuracy. In 2016, for example, Statcast failed to capture data on 12.5% of hit balls. More than a 1 in 10 failure rate might be considered a bust of a product. Such analysis from the best in the ball launch monitor industry (at a cost of tens of thousands of dollars a year) provides perspective as we evaluate hitting monitors priced at a fraction of the cost. Do we expect the Rapsodo, et al., hitting monitors to work? Of course. But clearly our expectations should come with the perspective that even the best in the game are less than 90% accurate at times. In the end, can we get reliable, repeatable metrics from a portable, durable ball exit speed monitor that delivers spray charts, strike zone heats and video analysis? 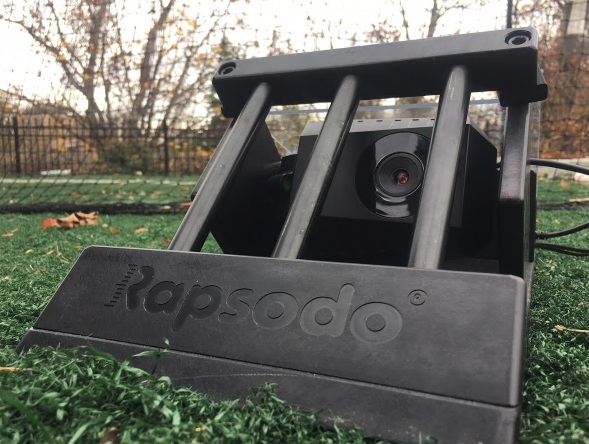 Our experience to date with the Rapsodo monitor—absolutely yes. The push for launch monitors in the baseball and softball space is rather new compared to golf monitors. Launch monitors in golf are so abundant they are hard to keep track of. Few features really differentiate the monitors, at least to us laymen. What most see is the difference in price and their accuracy. The baseball and softball launch monitor market is new enough that only a few stand out. Most, like Statcast and HitTrax are cost prohibitive, non portable and/or only work indoors. 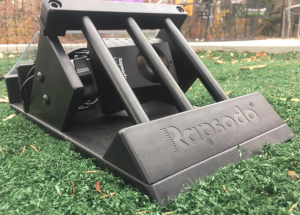 Rapsodo is a first to market solution for a less cost prohibitive baseball and softball ball exit speed and flight monitor that is portable and works both indoors and out. Others, we are sure, are on the scent of data collection for baseball and softball ball flight at the broader consumer level. 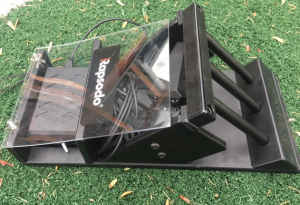 The Rapsodo device uses a slow motion camera to capture a 14-foot window around the plate. After it recognizes contact, the device analyzes the slow motion video it has captured around the ball’s initial flight. This includes metrics like exit speed and trajectory. It also tracks the inbound pitch speed. Importantly, the device also analyzes the seams on the ball to measure its spin rate and direction—this is a massive factor in ball flight trajectory and total distance. After the data is captured, it sends that data via wifi to a connected device. At the time of this writing, that device can be a Windows or Mac PC, as well as an iPad. (It does not, as of this writing, send it to an iPhone as there is no app for the iPhone yet). 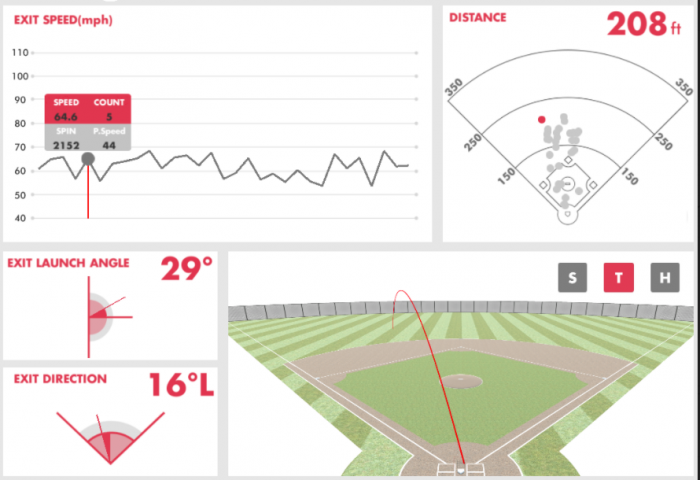 This app displays the metrics of the ball’s flight under your selected hitter’s profile. The metrics include tables, interactive charts and images, as well as the raw data of the flight. If you are using an iPad to capture the data, you can leverage its video functionality to attach a video of the swing to the Rapsodo data. It is, to say the least, awesome. This entire process, after contact, takes about 7 seconds to process within the device and get sent the app. Meaning, if you want to capture every hit, then expect to pause for 7 seconds between each swing. (There is a green/red light on the front of the camera letting you know when it is ready to capture another ball’s flight). The Rapsodo Hitting Monitor captures data and stores it under profiles you make within the app. These profiles are hitters. (Here at JBR, we use bats as profiles). Access to the hitting profiles are behind a paywall that Rapsodo manages. And, you guessed it, there is a monthly or annual fee associated with viewing and manipulating your database. In other words, the use of the machine and its profiles requires a subscription, too. There are generic profiles that come with the app. (Softball Guest and Baseball Guest). You can use these without making any profiles. However, the data on those profiles will not compile beyond the session you are in. In other words, it is possible to use the device without access to the database, but you are severely limited in terms of the app and program’s functionality. We definitely understand the reason behind the use of the database and player profiles. Tracking your progress is useful and servers do have fees. But, as a general rule in our lives, we simply dislike subscription services. At this point, however, it simply is what it is. And as the first to market consumer product like this, expect to pay for it both coming and going. The major barrier to entry to own the Rapsodo Hitting Monitor is the price and subscription fees. We suspect that will keep a good chunk of teams and players away. (The price, we should note, is a fraction of other serious competitors). For those who run hitting programs, coach at a high level, or are involved with elite travel teams, the Rapsodo Hitting Monitor will serve as a major advantage to your analysis where you can share or pass on the costs. The HitTrax system appears built more for the gaming market than the real data analysis market. HitTrax was the first to market and did well capturing the indoor batting cages who wanted to find a way to market a premium product. HitTrax allows for competitive teams to play each other via their servers in remote locations. The idea is fascinating and quite fun to be a part of. Imagine a men’s slow-pitch league in the dead of a Michigan winter playing a slowpitch team from Venezuala and you start to catch the vision of HitTrax. For personal consumer type use, the HitTrax struggles to make a ton of sense. The device, for one, is expensive compared to Rapsodo. 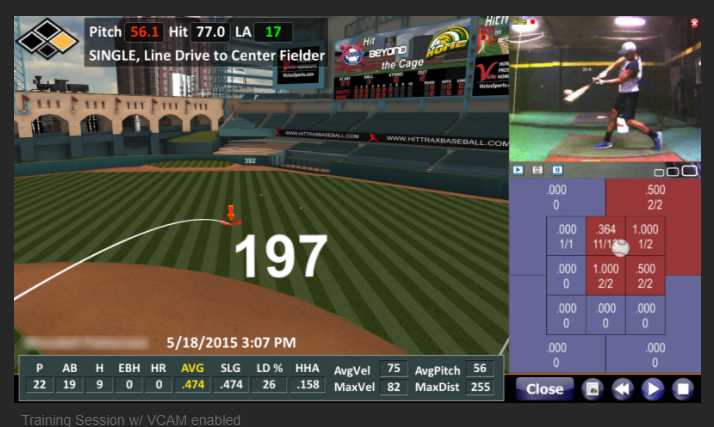 Last we checked, the full service HitTrax was near $20,000 plus some subscription fees. As well, the HitTrax is not built to be portable, but instead, set up in a cage. It also does not work outdoors like the Rapsodo. For the real ball flight geeks out there, we note, HitTrax does not measure ball spin. Instead, it just measures ball exit speed and trajectory. This gives a less accurate approximation of actual ball flight distance. However, HitTrax’s data is projected on real MLB fields, making it a ton of fun to see if you or someone on your team can take one out of a digital Fenway, for example. 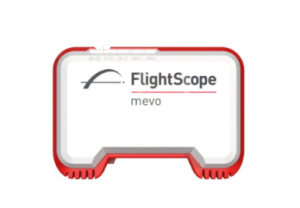 The FlightsScope MEVO is also a new ball exit speed and launch angle monitor. It lacks a significant number of features the Raspodo offers, but also comes at a considerably lower cost. When compared to the Rapsodo it lacks the scatter plot chart, the strike zone chart, and any ability to deliver a pitch via machine, person or soft toss. All captured data is from a stationary ball making it, for the purposes of Just Bat Reviews, almost useless. We have not found it any more useful than our Pocket Radar (amazon price) which is less expensive, yet comes with more usefulness, we think. Launch angle, which the MEVO does deliver too, does not appear to be that useful a metric. The MEVO is good for exit speeds and launch angles off of tee work that is hit mostly back up the middle. It works as a directional radar gun with the functionality to measure launch angle, too. 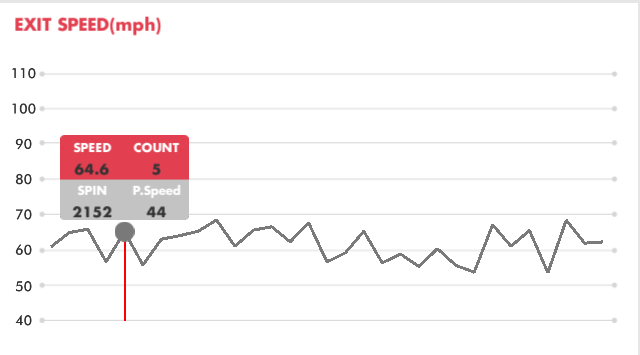 Bat performance is a function of how it performs on inbound pitches—not stationary objects. That said, if you already have a high end radar gun and would like a low end hitting speed monitor, then the MEVO might be right for you. Otherwise, save a few bucks, take your best guess on launch angel, and check out the Pocket Radar. Previous: Previous post: Hitting Vault Review | Drills, Videos, Is Lisle Worth It?